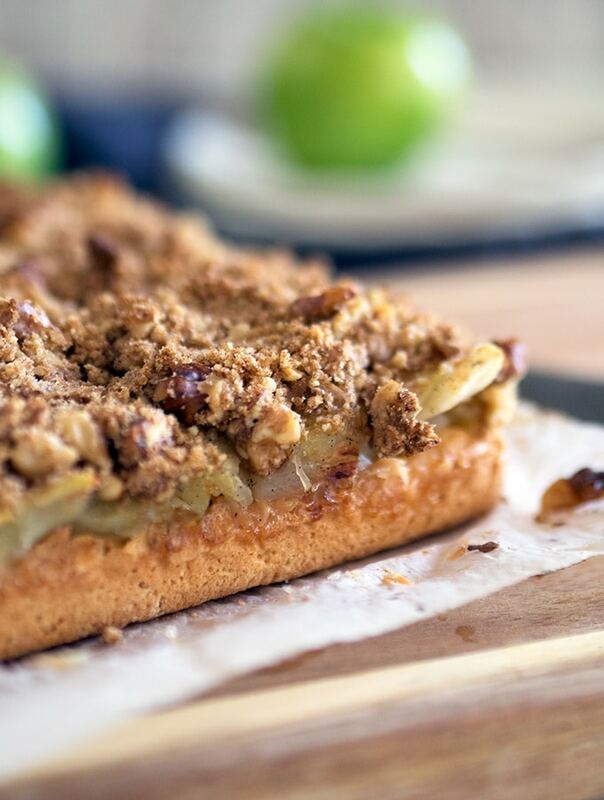 Apple walnut crumble slice is filled with Australian Granny Smith apples and topped with a cinnamon and nutmeg laced walnut crumble. I do love the textural consistency of slices. Their bases can range from crunchy to cake like. The topping can be as simple as some icing to a more complex multi layer creation. 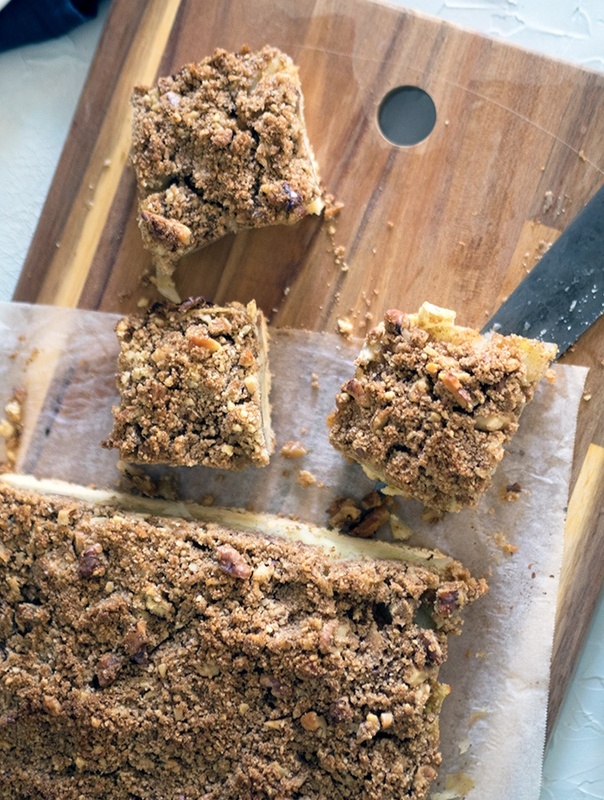 This apple walnut crumble slice isn’t too difficult or time consuming if you are using a food processor. The base falls into the crunchy category and is biscuit in style. 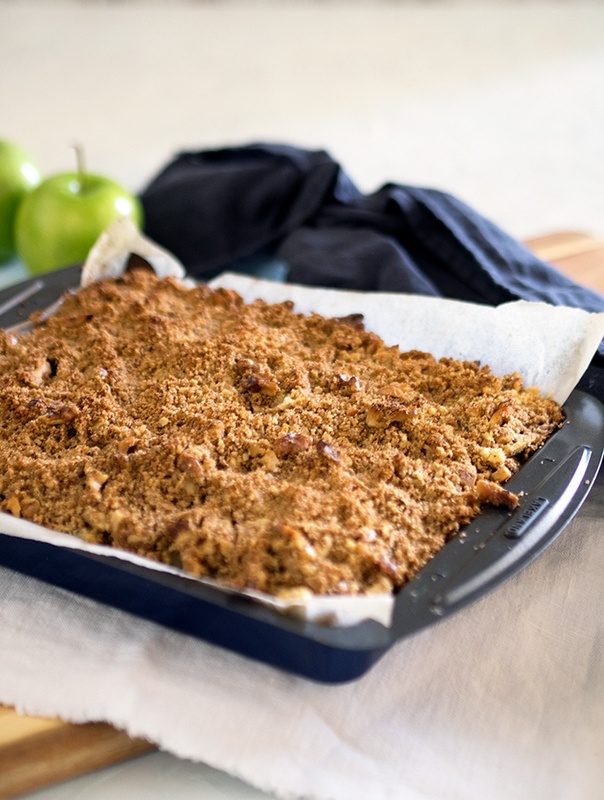 It has a simple filling of stewed apples which is then topped with a walnut crumble laced with cinnamon and nutmeg. 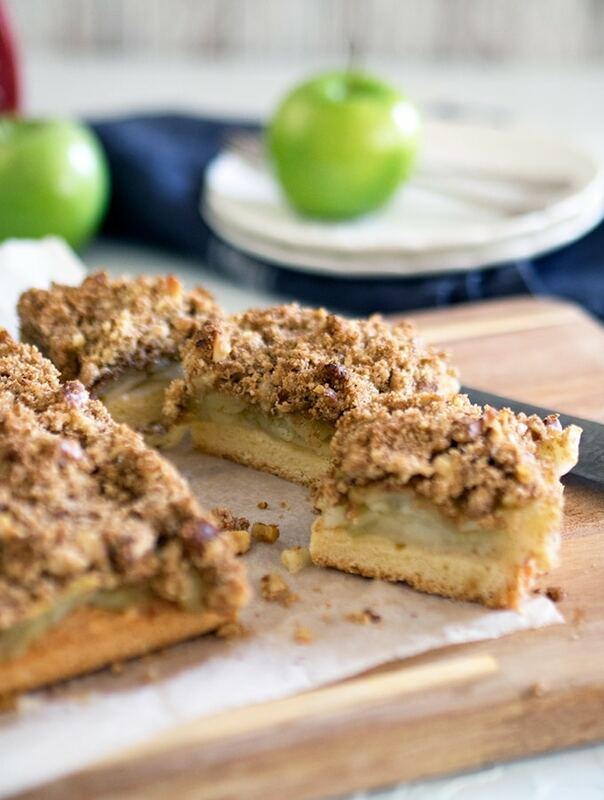 If you are a fan of apple crumble, then you will be a fan of this slice. 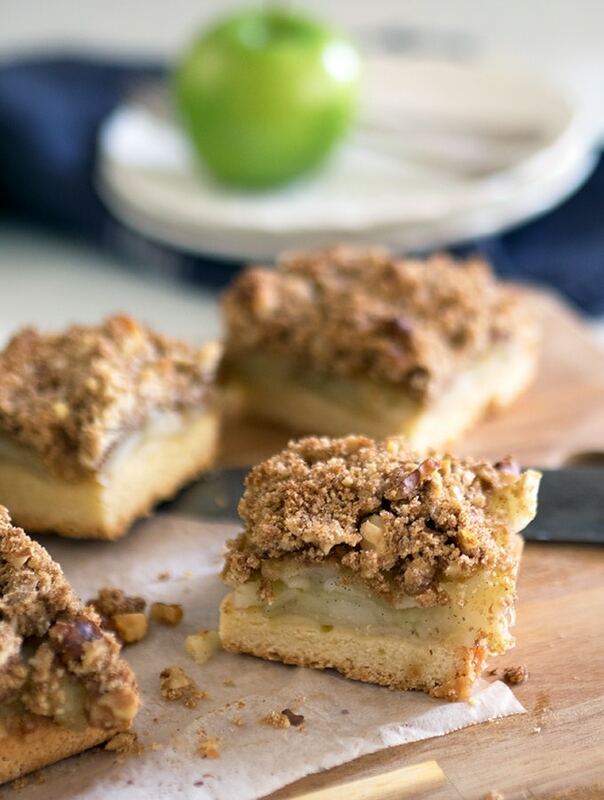 I generally serve my apple walnut crumble slice once cooled, simply dusted with icing sugar (confectioners sugar). But you could also serve this slice straight from the oven with a nice big scoop of vanilla bean ice cream. A drizzle of caramel sauce wouldn’t go astray either. The walnuts in the crumble are easily swapped out for your favourite nut. Pecans or almonds would be a tasty alternative. The simple apple filling could also be spruced up a little. This is easily done with the addition of a handful of dried sultanas or chopped dried apricots. As I keep saying to you guys, don’t leave your imagination at the kitchen door. If you have a great base recipe that the family loves, play around and change it up. Lamington Tin: A lamington tin is a rectangular baking tin 20cm x 30cm (8 x 12 inches) in size. It isn’t as deep as a brownie or cake tin. Granny Smith Apples: These are an Australian variety of apple, which are tart with a green skin. Any tart baking apple can be substituted. Leftovers can be stored in an airtight container for a couple of days. Recipe not suitable to freeze. Preheat oven 180 deg C (360 deg F). Grease and line a 20cm x 30cm lamington tin with baking paper. Extend the baking paper 5cm above the edges of the tin. In a food processor place plain flour, cornflour, baking powder and butter. Process until fine crumbs form. If you don’t have a food processor, place plain flour, cornflour, baking powder and butter (cut into small cubes) into a large bowl. Rub the butter through the dry ingredients with the tips of your fingers until the mixture resembles a fine crumb. Add egg and cold water, process until the pastry dough comes together. If not using a food processor mix with a spoon and then knead until just combined. Press dough into prepared lamington tin, evenly, until the base of the tin is covered. Place lamington tin in the refrigerator for 20 minutes to chill. While the base of the slice is chilling and then baking prepare the apple filling and walnut crumble. Once chilled line pastry dough with a piece of baking paper. Top the baking paper with baking weights or uncooked rice. Place in the oven and blind bake for 15 minutes or until the edges have just started to brown. Remove baking weights (or rice) and baking paper. Bake for a further 8 – 10 minutes until base is lightly golden and remove from oven. Increase oven temperature to 200 deg C (390 deg F). 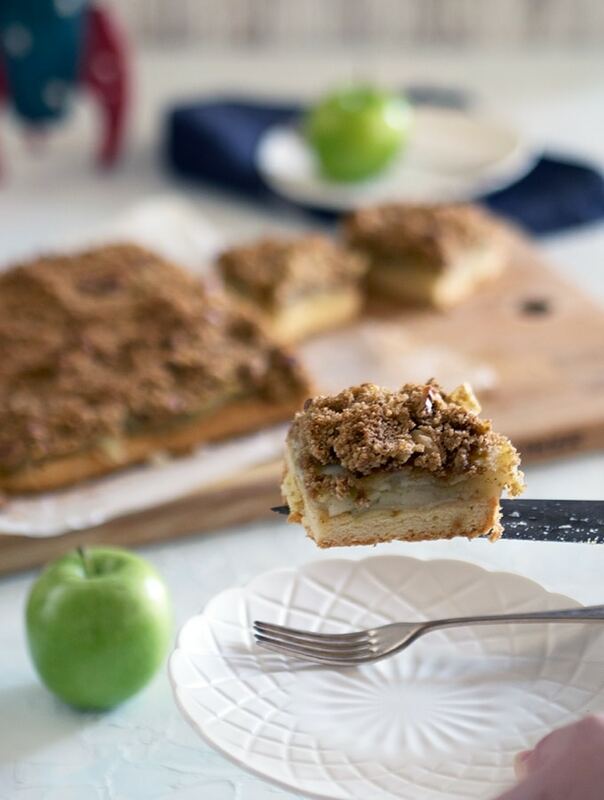 Spread apple filling over the top of the pastry base and then top with the walnut crumble. Bake for 30 minutes or until the crumble is golden. Cool on a wire cooling rack. Once cooled sprinkle with icing sugar and cut into squares. Place apple slices with 125ml (1/2 cup) water in a large saucepan. Over a medium heat bring the mixture to a boil. Reduce heat, cover and simmer for 10 minutes. Stir occasionally, when apples are tender they are ready. Drain well. In a large bowl place flour and butter. Rub butter through the flour with the tips of your fingers until the mixture resembles coarse breadcrumbs. Add sugar, baking powder, cinnamon, nutmeg and walnuts. I think it will be very delicious. definitely I will make it.